So that left something simple, like a handmade Valentine. I mulled it over for a couple days, and then came up with a few ideas last weekend that made me giggle. Putting them together was a pain and a half - not to mention tested the limits of my Photoshop know-how - but I finally have a few options to share with you guys. I hope you like them! That's my own hen-scratched drawing up there, since I didn't have the time to get a more artistically-inclined friend to do it for me. My ancient tablet refuses to work in Photoshop, but John found me a simple Paint-like program for the Mac called Paintbrush. I gleefully took to it this afternoon like a three-year-old with a new pack of crayons - and that's actually my THIRD attempt up there, so I welcome your derision and/or pity. Ah, but wait, there's more! You KNOW I had to make one with a cake pun, right? 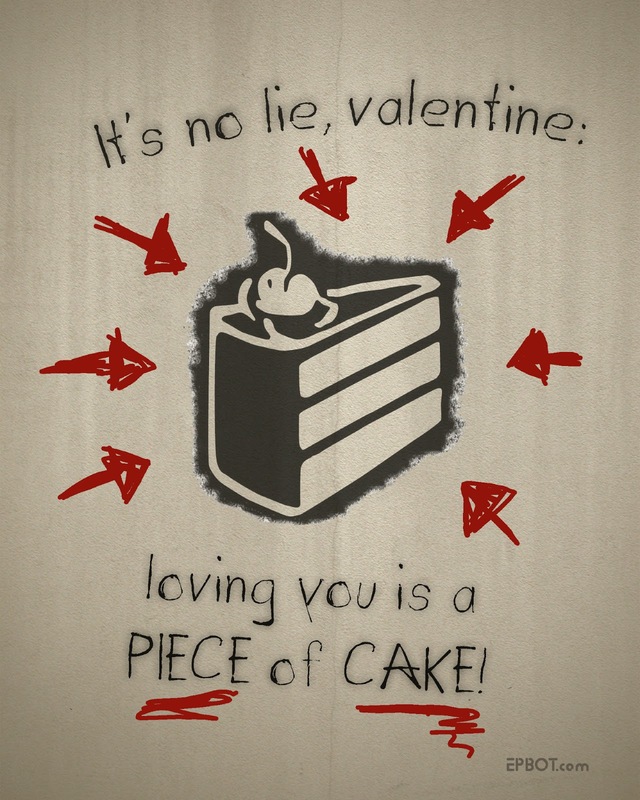 Notice the arrow pointing from "lie" to the cake? Hehehhe. You could also print the first one and then go to town on it with some markers - maybe add a little custom graffiti? Sky's the limit, really. So that's one sweet one, one punny one...what's next? Why, something EVIL, of course! 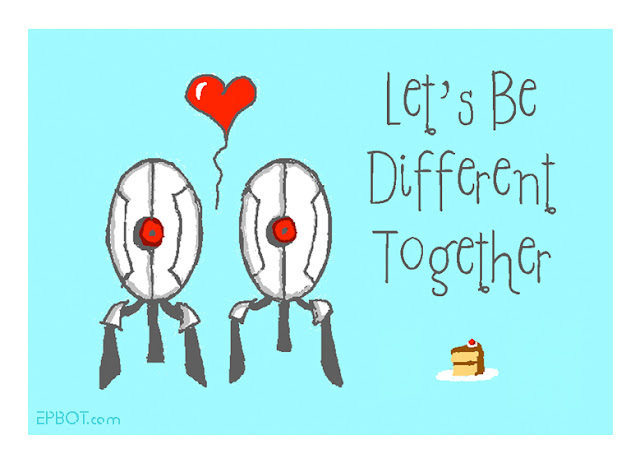 I get the feeling this is exactly the kind of Valentine GLaDOS would send. Feel free to save and print any of these you like, guys. (Click the pics to embiggen.) I tried to make the watermarks as unobtrusive as possible, but you can still always erase them prior to printing. Just keep the watermarks in place if you share or post these online, please - we all know how images have a way of wandering far from home on the 'web. Oh, and this is the perfect time to announce the winner of my Portal Lemon Grenade! So, the randomly selected winner IS...the Elizabeth with a blog called The Elizabeth Archive! Congrats, Elizabeth, and please e-mail me your mailing address! Very cute, and definitely much better than I could have done! The handwriting on the final one is adorable! Also, I'm glad I'm not the only one who uses words like "embiggen". I used that one with my dad a few weeks ago and then had to explain what I meant. Cute! I have a tradition of giving my boyfriend Doctor Who-themed Valentine and anniversary drawings. My first was of K-9 having a crush on his dog. The second was of Amy and Roman Rory. This one will be a Dalek saying "What is the meaning of this holiday?!?" (taken from one of my favorite Dalek quotes: "what is the meaning of this negative?!?" I made a portal valentine AND a Bioshock one, and I also made a Ghostbusters one for you. They are just ripe for printing out or emailing. There are also some smutty ones on my blarg too. I know you belong strongly in giving credit where credit is due, so I confess to being a bit confused about why epbot.com is plastered all over a picture you admit isn't yours (although I'm sure it does fall into fair use) Maybe make a double-sided so your logo can go on the back? A Cards by Jen? sorta' thing? And P.S. "Don't remove my watermark from this card featuring a picture that isn't mine because things have a way of wandering off?" I love you (in a non-stalkeriffic way) and I'm sure your other fans would tear my throat out (they're a protective bunch) but I think you're WAY off-base using what are basically stolen images and ideas and putting your watermark on them. 100years from now some little geek kid is going to be all "Jen at Epbot invented Portal" and it's going to be all your fault. Fix this! Ok, I LOVE the last one. I really wish my husband liked Portal (he says it makes his brain hurt) because I would print it out for him. The purpose of a watermark is to show where an image originated. I'm not claiming to have invented Portal (??) or any of its characters, and I don't believe anyone will ever confuse fan art - which is what this is - as such. And lastly, I'm not trying to profit from these by selling anything, so your suggestion of making double-sided cards is moot; I'm not making ANY cards. If I were, and selling them, then you might make a case for copyright infringement (as you could for any fan art, for that matter), but I'm not. I'm just sharing something I made. I'm sorry if I somehow didn't make all that clear with the post, but even more sorry that you think I'm capable of blatantly stealing another artist's work. Of all the things you could accuse me of, that cuts deepest of all. "Embiggen". Such a funny word! I love the turret one!! So cuuuute! I can just hear their little voices in harmony. I <3 these! Very clever. I have a soft spot for companion cubes (still planning on making my own companion cube wall hangings from one of your earlier posts), but the cake one is also fun! Fantastic job! *Squee*. The sentiments on that GLaDOS card is right up my alley... Bu-ut boyfriend is NOT a portal fan. Looks like I'll have to come up with something of my own. Off to play video games in the name of "love". 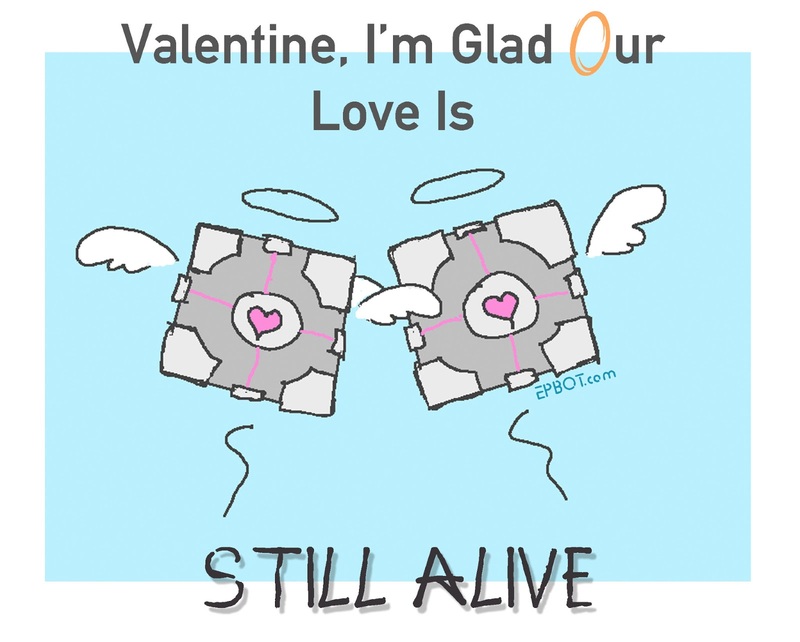 No joke - I got my husband a Companion Cube card, and a "Black Mesa ID badge" with his picture and fake evil credentials. This will go with his black labcoat! Ohh, and I'm making him a picture with images of our brains (actual MRI brain scan images) and images of Portal interspersed to go with it. ;) LOVE!! Boo Anon for bashing Jen like that! It was a little unclear at the beginning, because I'm so used to you posting things from OTHER sites here on Epbot, but at the end you stated clearly that these were yours (you even MADE ONE FOR JOHN!! ;D). Love these, Jen. Too cute. Good inspiration for making my own. My hubby is a Skyrim fan. Last Valentine's Day I made him a card using words from the Beatles song 'When I'm 64'; altering the lyrics slightly, "When you get older, losing your hair, many years from now, I will still be sending you a Valentine...". I added cute cartoon pictures of an old couple. 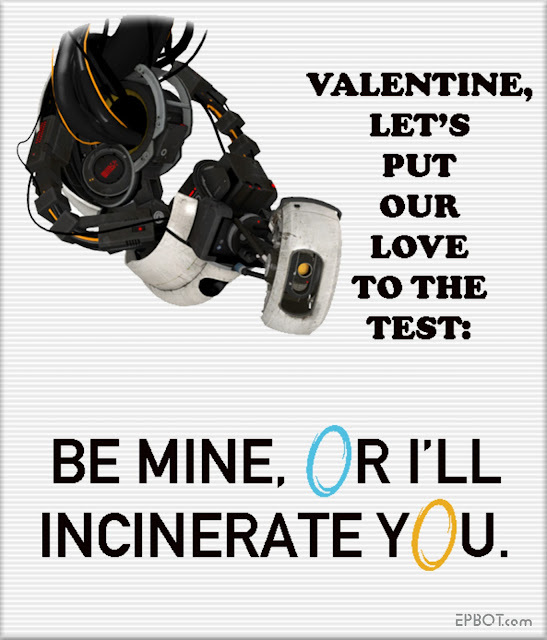 I am so using one Of these for my husband, unless I can think of one quoting cave Johnson. Ooh, girl, dontcha love it when people come for you and sign it Anonymous? In the vernacular of today's youth: Hataz gonna hate. I give my Vulcan the same card every year; Ralphie Wiggum's "I Choo-Choo-Choose You!" card. He gives me Godiva chocolate and a single rose, stating "Here, Klingon Wife; I bear your chocolate, and have killed this innocent flower to show my affection for you. Your absence would be keenly felt." Thanks Jen, Love the last one and shared it on facebook. great cards, thanks a lot for sharing! Love these! 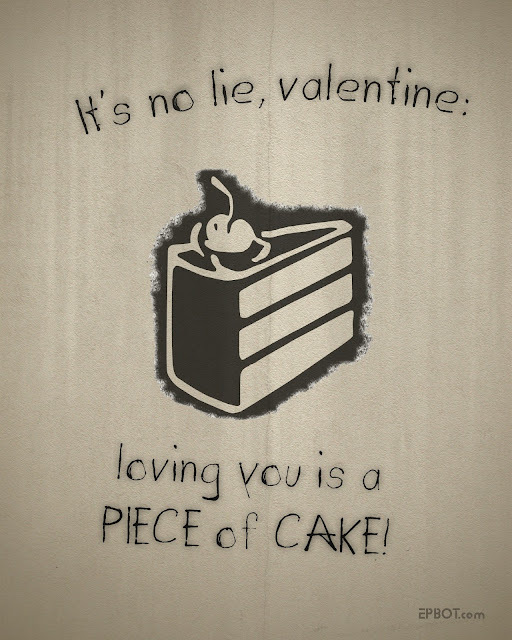 Judging by the Valve Employee Handbook, I'm guessing they would love these Valentines!